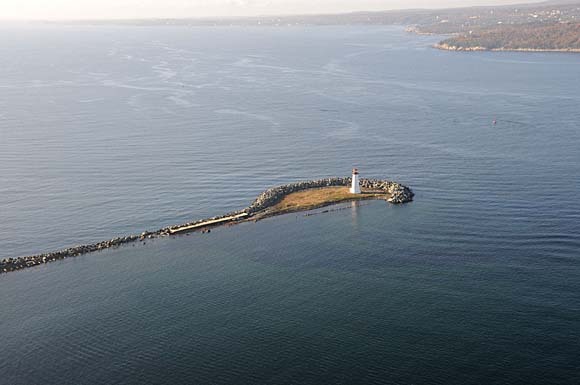 For over a century and a half the view seaward from Halifax has been marked by the long arm of Maughers Beach running off from McNab's Island and punctuated by a lighthouse. Every ship ever to call at Halifax has passed within a musket shot of it's tower, called by one observer, "our own Statue of Liberty." Information Sources: Discover McNabs Island by the Friends of Mcnabs Island, Dept. of Marine Annual Reports, Dartmouth Coast Guard Records, Public Archives of Nova Scotia clippings and The Sea Road to Halifax by Hugh Pullen. Maughers Beach Lighthouse stands at the end of a curving white sand beach on the west side of McNabs Island, at the inner entrance to Halifax harbour. 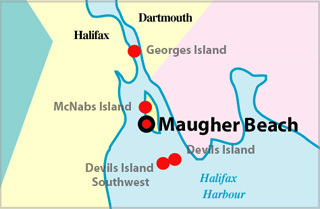 The beach was named after Joshua Maugher (pronounced"Major"), a rum distiller and powerful merchant from early Halifax who used the beach to dry fish. It is also popularly known as "Hangman's Beach" because of its use by the Royal Navy during the Napoleonic wars to hang the bodies of executed mutineers as a warning to crews of ships entering the harbour that this was a port where they had better behave themselves. In 1814, the British army began building a stout round granite Martello tower at the end of the beach to house a small cannon battery to defend the harbour entrance. The tower took fourteen years to complete, but as early as 1815, lights were shown at the site when naval ships were expected. In 1826, the provincial legislature decided that a permanent light was needed to help ships into the inner harbour, and voted 1500 pounds for a lighthouse. To save money, the Lieutenant Governor persuaded the military to permit the placement of a lantern room on top of the martello tower, instead of building a separate lighthouse. The Ordnance Board agreed, as long as the light didn't obstruct the cannons in what came to be called Sherbrooke Tower. "Whether the two functions were compatible was never tested, fortunately perhaps," noted a sceptical Parks Canada historian. The light at Maughers Beach was used in 1851 by Abraham Gesner to test out the new fuel he had invented, kerosene, to replace whale oil. Although lighthouse officials were sceptical, the careful recording of the efficiency of kerosene by Maughers Beach keeper David George helped establish the fuel for standard use. A complex of buildings gradually spread over the end of Maughers Beach including a fog alarm building (erected in 1906), a duplex house for the team of keepers (built in 1913) and various sheds, boathouses and wharves. It was a precarious location at times. Facing the open Atlantic, the beach took the brunt of storms, acting as a breakwater for Halifax Harbour. McNabs Island residents such as Colin Cleveland recalled watching nervously from the main part of the island when waves broke over the roof of the keeper's house "and on one memorable occasion, the Maughers Beach outhouse came floating by!" Even the seven-foot-thick granite walls of the martello tower yielded in a brutal winter storm in 1931 which ripped much of the outer wall out of the south side of the tower. The tower was rebuilt, as were the ever-increasing wooden pilings and breakwaters which grew to contain the erosion of the beach which threatened to leave the light on an island of its own. Some granite boulders were added to the breakwater in 1957 and a massive rebuilding with boulders was completed in 1987. The barriers made the light more secure in later years but despite the seeming nearness to Halifax, Coast Guard correspondence indicates that the station was considered an isolated post due to its exposure and difficult access in winter. Thus two keepers were retained for mutual support right up to automation. Without water, phone or electricity until the 1970s, they relied on rainwater collected in basement cisterns and periodic radio contact. The fog alarm building was demolished in 1975 and the foghorn was moved to the lighthouse where it remained until 1993 when it was silenced after sounding with various horns for 104 years. The Coast Guard hoped to automate the light as early as 1973 and that year when Hector Lowe was hired as keeper he was told he would only be needed for six months. However, he was still there ten years later as problems monitoring the automatic equipment required the assistance of a keeper until 1983. After automation, the Nova Scotia Lands and Forest Department considered keeping the duplex house for an interpretative centre, but decay and vandals reduced it to an eyesore and fire hazard, so it was demolished and burned when the breakwater was rebuilt in 1987. Foundations of the keeper's house and fog alarm building remain between the lighthouse and the helicopter pad now used for maintenance and inspection visits. 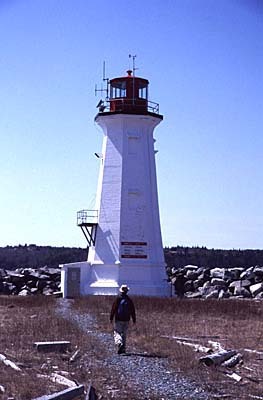 In 2003, Hurricane Juan breached the sand barrier between the ocean and the tidal pond on McNabs Island, so the lighthouse in now difficult to access along the beach. Tides after Hurricane Juan, and later storm surges, have removed much of the bank on the harbour side of the lighthouse. Maughers Beach has seen its share of shipwrecks. As early as 1789, the Royal Gazette mentions a wreck going to pieces on the beach. For years the Maughers Beach light keepers displayed the signboard of the Norwegian bark Tordem Skjold, wrecked in 1872. She lost control tacking into the harbour passing too close to the lighthouse which took the wind out of its sails, but the crew managed to scramble safely ashore. In 1940, the British warship HMS Revenge ran down and sank HMCS Ypres, one of the small "gate vessels" that tended the anti-submarine nets running from Maughers Beach across toYork Redoubt. Fortunately no lives were lost. The Royal Canadian Navy maintains quarantine moorings in the cove. Because of electronic navigation they are now rarely used. One of the most memorable sights there, in the late 1970's, was a freighter that had been holed by an iceberg and managed to limp into Halifax. Light Height: 064ft feet above water level. Tower Height: 054ft feet high. Light Height: 057ft feet above water level.